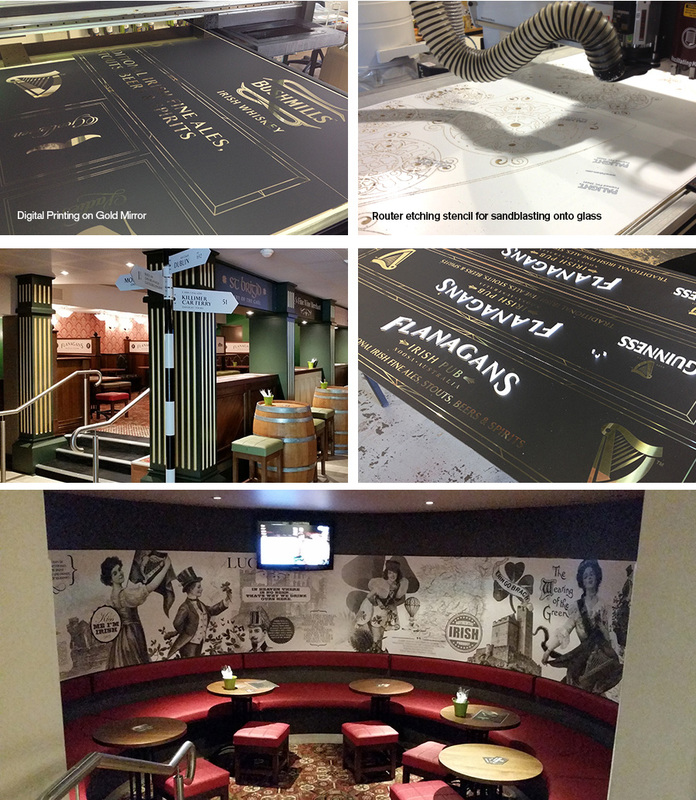 The past month has been very busy in production with some specialised signage requirements for a new venue on the Sunshine Coast, Flanagan’s Irish Pub. Working closely with the architect and interior designers, we used our extensive branding and signage capabilities to roll out a number of different signage applications throughout the interior of the Venue. Some of these included the production of stencils which were used for sandblasting onto glass, 3 dimensional signage on gold mirror, intricate directional signage and wallpaper graphics. All of these applications required specialty skills which were finished and installed by our team of dedicated production professionals. We are proud of the results which have exceeded our client’s expectations. We are always working on new ways to utilise our state-of-the-art print machinery. Pushing the limits is what sets us apart from our competitors.